E ast Side Showroom is an Austin drink destination where craft is not trendy, it's enduring. Along with a memorable personality—the decor is a mashup of steampunk and George Bailey's parlor in It's a Wonderful Life—it has developed a solid reputation for serving high-qual- ity cocktails on Austin's less-gentrified though quite exciting side of town. But Austin has been growing—a lot—and that includes in East Side Showroom's direction ever since it's been open, going on six years now. Today, this former artisanal outpost has a yoga studio across the street and condos opening down the block. The neighborhood is changing, and Executive Barkeep Julianna Fry admits it's hard to predict how this will change the bar's character. "People actually live a block away from us now. That's not how all this was," she says, indicating the new development along the street. But even as East Side Showroom progresses into a neighborhood bar (and restaurant, serving seasonal American cuisine), Fry says the com- mitment to sophisticated craft cocktails, which set the place apart from Austin's bar scene in the first place, is as strong as ever: "There's no Red Bull cocktails, no flavored vodkas. Our juices and syr- ups are all made daily. Our ingredients are local whenever possible. We try to stay innovative and fresh by going back in time, using the styles, ingredients and context of the pre-Prohibition era as our style guide." Which is not to imply, however, that East Side Showroom is stuck in the past. Fry and the rest of the bar staff regularly change their menu of signature drinks to reflect the current cocktail mood of Austin as well as to showcase their high standards. Justin Mork, who's been a barkeep for about four years, says, "Our philosophy is really a commitment to artisanal and classic ingredients. 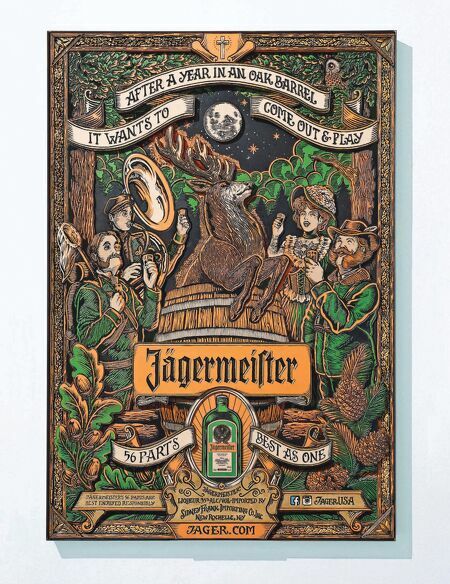 It's not about honoring a certain time period as much as it's about honoring a tradition of craftsmanship." 50 / the tasting panel / march 2015 A LONE STAR LIFE Won't You Be My Neighbor? EAST SIDE SHOWROOM WELCOMES AUSTIN'S COCKTAIL LOVERS TO THE NEIGHBORHOOD by Anthony Head / photos by Kirk Weddle Western Union This dark and lovely riff on the Negroni helps satisfy Austin's endless thirst for mezcal. Created by Justin Mork for East Side Showroom, the sharp, grassy silver mezcal complements the bitterness from the Campari and Italian vermouth. ◗ 1 oz. Campari ◗ 1 oz. Punt e Mes Vermouth ◗ 1 oz. Mezcal Union Uno ◗ Orange zest for garnish ◗ Pour ingredients into a rocks glass. Fill with cubed ice and stir. Garnish with wide orange zest. 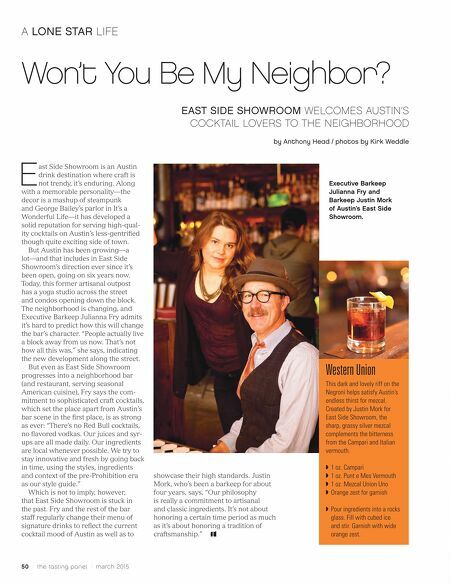 Executive Barkeep Julianna Fry and Barkeep Justin Mork of Austin's East Side Showroom.